Tomorrow my show will be exactly 2 weeks away and even though I’ve been working very hard and most of the big stuff has been taken care of, there’s still a ton of work that needs to be done. There are just a lot of things that you simply cannot do upfront and these last two weeks are crucial, especially when it comes to the marketing. Well in the midst of all that I’m trying to finish ‘Vancouver’, a piece that simply has to be finished before the show. I absolutely love this whole process of organizing a solo show, even though it’s been a huge challenge. I really like having a goal to work towards and generally I thrive under pressure. Painting under pressure however is a completely different story. It takes a whole lot of discipline and mental strength to focus on the painting and to not get distracted by that looming deadline and all the little things that still need doing. This makes the painting process a lot more draining then usual. Yesterday I spent the day in my studio working on Vancouver, the painting is progressing nicely and I’ve moved into the final stages of the creation process. Usually I paint until my husband gets home and then I’ll retire from my studio for the day and focus on making dinner and spending some quality time with my husband. Most of the time that works perfectly fine, yesterday however, I had ‘painting brain’ as I like to call it. I had so much trouble taking myself away from the painting and focussing on anything else. While I was making dinner I went back into my studio 3 or 4 times just to sit with the painting and observe it to see where it needed work. I did learn a lot about the painting while sitting there. But it also made me realize how completely drained I felt. My mind is a funny place, at first it doesn’t allow me to focus on my painting because of all the other stuff that’s ‘in the way’ and then it doesn’t allow me to let it go so I can relax at the end of the day. This all has to do with the looming deadline of my show, finishing ‘Vancouver’ happens to be one of the most important items on my seemingly endless to-do list. With every single thing I do I’m in a constant ‘battle’ with my own mind. It keeps telling me that there are so many other things that need doing as well and shouldn’t I be doing any of the other ones first? Of course not! I’m still the boss of me, no matter what my mind has to say about it! Vancouver will be finished in time and there will be an end to my endless to-do list. Come April 13th I’ll be as ready as I’ll ever be. You are all invited to come over and see the fruits of my labour at the Mile End gallery in Montreal; 5345 Ave. Du Parc, from April 13-23. See you there? About six month ago I decided to rent a gallery space in downtown Montreal to organize my first Solo Show. I’ve been busy with the preparations ever since and now the opening of my show is only 3 weeks away! To be honest, overall I’ve been pretty calm and everything seems to be going pretty smoothy. My promotional materials are ready, the press release has been written and translated, I’ve decided on the pieces that are going to be in the show and how they are going to be displayed and I’ve even finished my price list. Now there’s still tons of stuff to do, I’ve got this to do list that keeps getting longer instead of shorter. Some things just can’t be done in advance. Having the date of the show scheduled at least 6 months in advance has been absolutely necessary for a proper show preparation. Especially since this is my first time. It takes time to do proper marketing and there are just so many little things that keep coming up. But all in all this has all been a very positive experience, especially because it gives you a proper goal to work towards. As an artist, especially when you work alone a lot, you often lack a real deadline. Most of the time you’re just creating without a real goal. Organizing a show is a wonderful way to push yourself and to work towards something, I have experienced it as very stimulating. Now off course it’s not all rainbows and butterflies. The biggest downside of all this organizing would be the lack of time in the studio. About half my time goes towards work behind the computer, meetings about my show and other prep work. Especially the last couple of weeks now that the show’s really getting close. I still have one more piece to finish for my show and I’ve basically made peace with the idea that I’ll not be able to work on anything till after the show. Hopefully this will not be the case because I’ve tons of ideas that need to come out. But then again, if there’s prep work that needs to be done I’ll not be able to paint anyways, that’s just how my mind works. I’d rather finish something and scratch it off the list then let it sit till the last moment. even if it’s something small and insignificant. I do have this really cool idea for this extended project which might even result in it’s own show but for now that’s still brewing away in my head. This week I’ll at least be able to spend some time in the studio. ‘Vancouver’ has had time to dry so now it’s time to transfer the pieces to the wood panel and start the final stage of the painting. Let’s hope I’ll also be able to scratch some of the thing off my to do list, it would be nice if I could actually make it shorter instead of longer in these last weeks before the show. My show will run from April 13-23 at the Mile End Gallery on Avenue du Parc in Montreal, visit my site (www.denisebuismanpilger.com) for more information. Wish me luck! While applying the gel to the photo elements for ‘Vancouver’ I realized that this piece is a lot more technical then previous pieces, mainly because of its size. When I was creating Toronto, which was the first piece that used images that were larger then the paper I could print, I ran into some problems when reassembling the gel pieces on the canvas. The gel is very flexible which caused some size changes in the different pieces of the photograph, which made it almost impossible to fit them together on the canvas after the paper had been removed form the back. To prevent this form happening again I have now assembled the larger photographs before I applied the gel. Hereby I will hopefully create one large gel sheet instead of a couple of separate ones that I need to assemble afterwards. While I’m hopefully avoiding the assembly problems I had last time I will undoubtedly run into a whole new set of technical problems due to working with these bigger sheets. It will be a challenge to transplant the larger sheets from the bath, where they soak, to the surface where I rub off the paper. I had to find a larger smooth surface to use as a rubbing station. And while removing the paper from the back I will have to be super careful not to damage the gel in the process. Then there will be the challenge of transferring the gel sheet to the panel and attaching it without any air bubbles. Now the last part will be easier because I work on wood instead of canvas this time. This will make it easier to apply pressure to get rid of the air but I’m not sure this will be enough. All in all this piece is going to be a technical challenge that is going to require a lot of patience but if I manage to overcome all these challenges I will have created a whole new size range I can work with, lots of new possibilities. Who thinks I can pull it off? Sooo, yeah.... I'm working on Vancouver, well, maybe working on is a bit optimistic. Sometimes when I'm working on a piece and I'm in the early stages, I get a sort of block, it's an actual physical feeling, it's hard to describe. At this point I will often unconsciously look for other things to do, things that, in my mind, are way more important that actually working on this painting. I just realized that was exactly what I am doing at this moment. I kind of knew this was coming when i started this piece,i think I mentioned it in an earlier blog entry. It has something to do with the fact that I know I have very little material to work with for this piece and somehow also with the fact that I'm not quite happy with the choices I've made so far on this piece, at least I think that's what it is. Now you would think that there would be an easy solution for this, just go and do something else and get back to it later. But somehow that doesn't help either because that would actually make me feel even worse about myself. I know that there's only one way to get out of this Vancouver shaped funk and that is to just get on with it. I will probably spend the rest of the day sorting through my pictures and maybe print one or two to add to the piece but it is going to be slow going for the ret of the day. And then maybe, if I'm lucky, things will fall into place tomorrow. I would be interested to know if this is just my creative process or if it's something most artists deal with, what do you think? We’re in the middle of a snowstorm here in Montreal, a perfect time for me to bundle up behind my computer and upload some of my newest pieces to my website. I uploaded two new experimental pieces: ‘Curves’ and ‘Wandering Cat’ which both can be found in the ‘Experimental Gallery’. I also uploaded all six pieces of my Yellow Cab Project which I finally finishes last week. All of this can be found in the ‘Traveling the World gallery’ and they will also be shown at my upcoming solo show. For more information on my upcoming show keep an eye on the news section on my home page or subscribe to my newsletter. 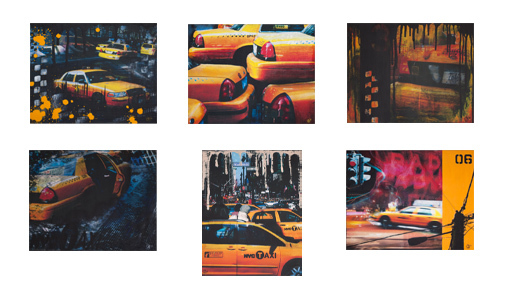 Yesterday I finished the last piece of my Yellow Cab Project, this project consists of six pieces all featuring yellow cabs. All six pieces came out distinctly different, which I like. I will post them to my website tomorrow or early next week, together with two experimental pieces I finished recently. The most valuable thing that came out of this project for me personally was the experience of working on wood panels instead of canvas. I have to say I really like the wood panels, I've already prepared a bigger one for my next piece and if that's a success I might even switch on more future projects. The wood panels give way more stability when glueing my acrylic gel transfers, which helps with the air bubbles a lot. So, a good development it seems. For my next piece I will be doing Vancouver. It will be the same size as my piece on Toronto, and as I mentioned earlier, it will be on a wood panel instead of canvas. This will be a challenging project for multiple reasons. First challenge is that I only spend about half a day in the city and it was raining the whole time. That means that I do not have a lot of material to work with. The rainy picture might make it more interesting though, I've never done a piece where I solely used rain pictures. The fact that I have very limited photo material will be a huge challenge that will stretch my creativity to the limit. A good thing I know, but it is going to cause me a lot of frustration during the first stages of the work. Another challenge will come from a new method I want to try out. When I did the Toronto piece I had to print a couple of buildings in pieces because of the size limit of my printer. this caused some problems when I reassembled the gel transfers, the gel is flexible so it stretches or shrinks a little which makes reassembly very difficult. For this piece I want to see if I can reassemble the pieces before I add the gel. This will mean I'm going to have bigger gel pieces to work with which is going to be extremely difficult during the paper removal and glueing stages. This is where I think the wood panel will help a lot, or at least I hope it will. These are the things that keep my mind occupied at the moment, I'm sure I will be raging some more before this piece is done, I see artistic frustrations in my future, bring it on! 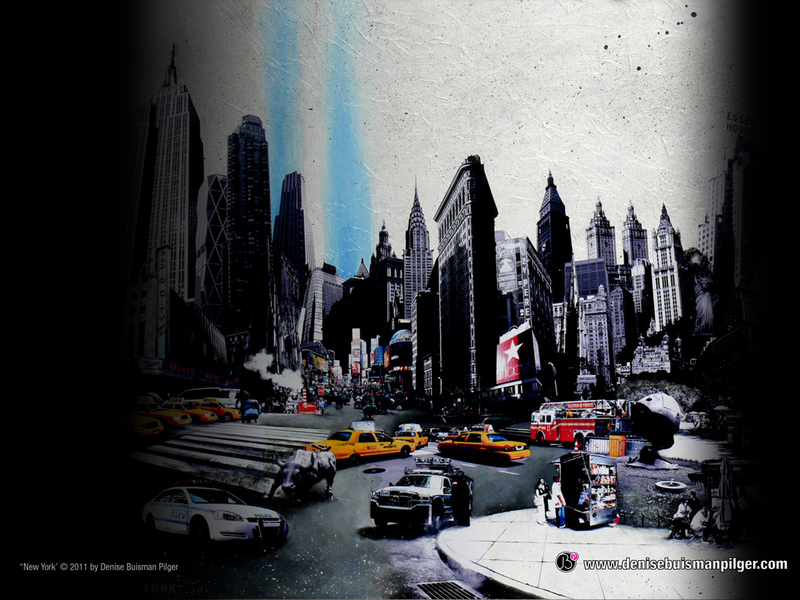 Enjoy Denise Buisman Pilger's artwork for free! The artist has created a special treat for her fans. You can now enjoy one of Denise Buisman Pilger’s artworks for free! 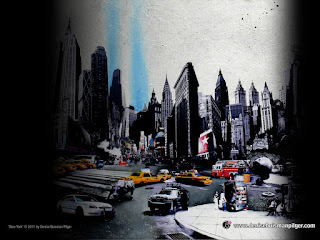 Follow the link in this blog, download your free desktop wallpaper and transform your desktop into an artwork. It would be greatly appreciated if you would 'like' the artist's Facebook page when you download your wallpaper and please tell all your friends about it!